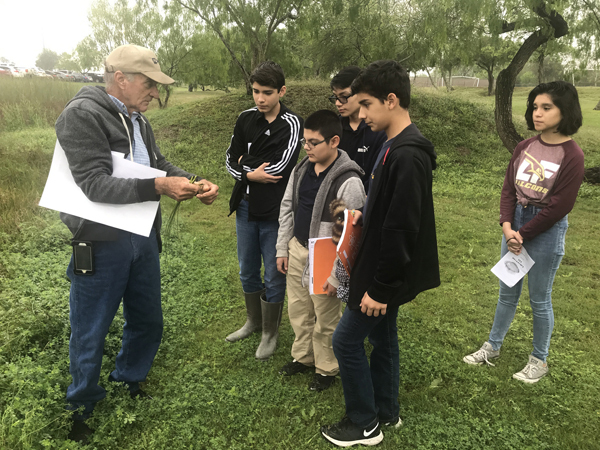 Middle school students taking Project Lead the Way Energy and Environment classes took a field trip to Los Fresnos High School Wednesday to learn about different types of water pollution. There is wetlands ecosystem in front of Los Fresnos High School, which was part of a resaca at one time. It is known as Falcon Pond, although older historians called it Agua Negra. Through Project Based Learning (PBL), students are working on the Falcon Pond Beautification Project for the first time. The PBL centers upon students taking water quality samples that directly feed into Falcon Pond. This project is being paid for through grant funds provided through the Clean Water Act of 1972. The Environmental Protection Agency allocated funds to the Texas Commission on Environmental Quality (TCEQ), which has in turn funded a $15,000 grant proposal submitted by the Texas Water Resources Institute, a Texas A&M Agri-Life Extension office. This grant provides funding to work on a collaborative project with the City of Los Fresnos and Los Fresnos CISD. These funds are intended to be used in local coastal zone to tackle problems related to non-point source pollution. Guzman worked in collaboration with Jaime Flores, Arroyo Colorado Watershed Coordinator, local botanist Michael Heep and the Texas Stream Team. Students worked with topographic maps of the area and identified the flora species hosted near the pond. LFHS AP Biology students assisted in the project. Students took water samples across six different areas and testing the water for pH, temperature, dissolved oxygen and nitrate concentrations. They rotated through four stations – flora identification, topographic maps, pollution types and water sample testing. Students are a mixture of 7th and 8th grade students taking the Energy and Environment elective class. Students received hands-on learning, field experience and first hand information directly from our community experts.